Imagine you are a leader. There are many models you can follow to enable your team to achieve success. One approach is to focus on the following themes. You can help the team to clarify, communicate and commit to achieving a positive purpose. You can help the team to build a positive culture and follow key principles towards achieving the purpose. You can help the team to deliver positive performances, find solutions to challenges and achieve its purpose. 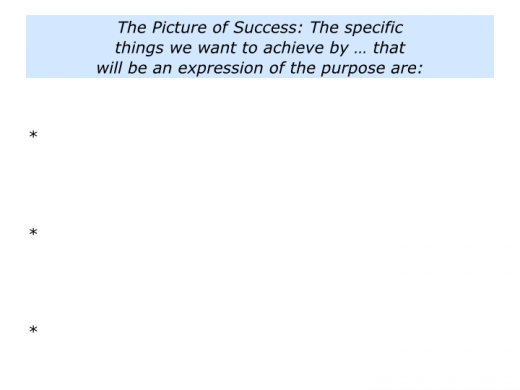 Let’s explore some of the steps you can take help people to go through these stages and achieve its picture of success. 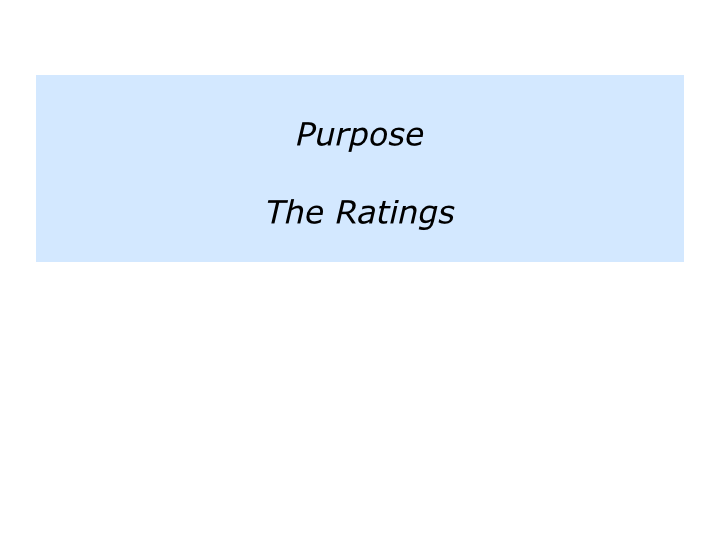 People love to have a sense of purpose. They love to do something they feel passionately about. Pursuing this activity often brings meaning to their lives. They can refer back to this core compass when things get tough in their lives or work. Great teams also have a clear purpose. They may aim to climb a particular mountain, find a vaccine for an illness, help other people to succeed, win a sporting trophy or whatever. They have a compelling reason for being. Imagine you lead a team in an organisation. How can you create a compelling purpose that appeals to both the heart and head? Good teams focus on a purpose that engages people on an emotional level, rather than just on an economic level. Such teams often see themselves as being in the service business and aim to help their customers to succeed. “Today we are going to look at how to continue to be a super team. “You are responsible for leading several hundred people across the world. Bearing this in mind, I would like us to keep our eyes on our service ethic. “We employ people who have this service ethic. They need to enjoy helping both their external and internal customers. If they don’t enjoy doing this, don’t employ them. 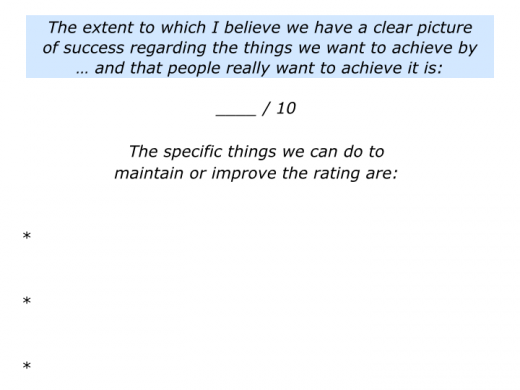 Great teams know they must deliver the required Scorecard – including the financial targets – because otherwise they will not have a job. But they often add other stimulating projects. Such teams translate their overall goals into a compelling purpose. Imagine you want to do this in your own way. One approach is to gather your team together and invite them to do the following exercise. may be the overall purpose of the team. Some teams manage to phrase their overall purpose in a memorable one liner. Others may need to use a much longer sentence or, perhaps, break down the purpose into several short statements. We want to build a positive culture, play positive football and get positive results. The programme aimed to provide young players with educational experiences they could use both on and off the field for the rest of their lives. write what they believe could be the team’s purpose. Ask each person to complete the following sentence. 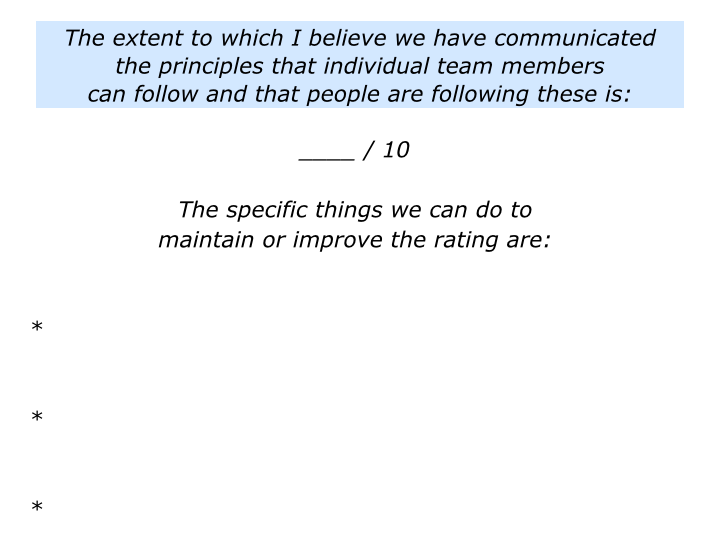 They are to write what they believe it is important for the team to do. Later you will explore all their suggestions, agree on the priorities and then wordsmith the agreed purpose. For the moment, however, invite them to complete the statement above. 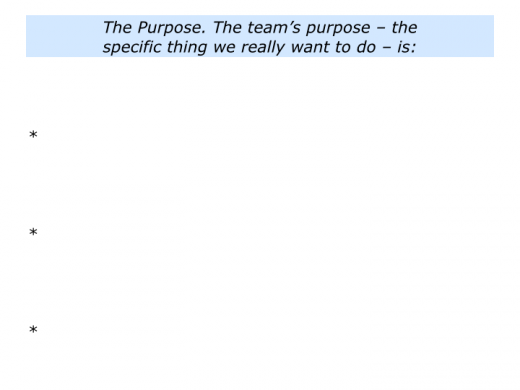 what they believe could be the team’s purpose. Give each person time to describe their view of the team’s purpose. Encourage them to explain this in depth, rather than have to justify it. 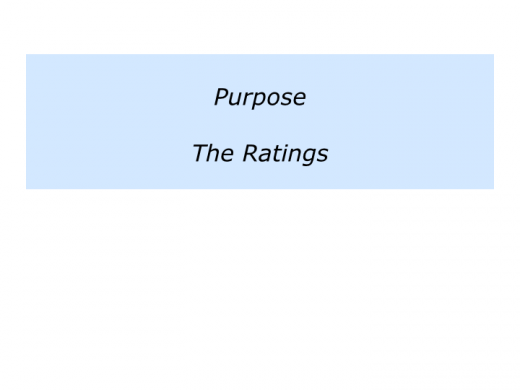 emerged from people’s views of the team’s purpose. Sort the themes, perhaps in bullet points, and agree on the order of priority. You may then create something like the following. together the wording for the team’s purpose. To make sure it is relatively short – you can bring it to life by giving examples. To make sure it appeals to the heart as well as the head. To make sure it focuses on what you can control – rather than what you can’t – and how doing this will help others. 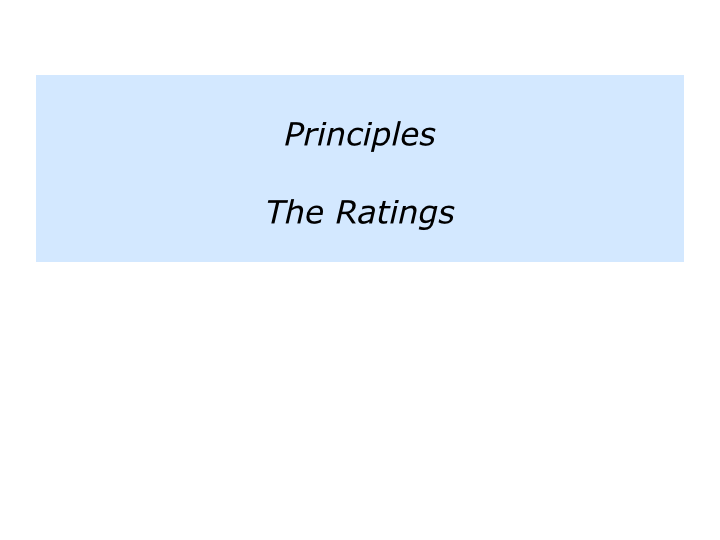 Some companies, for example, talk about being Number 1 in their particular field. 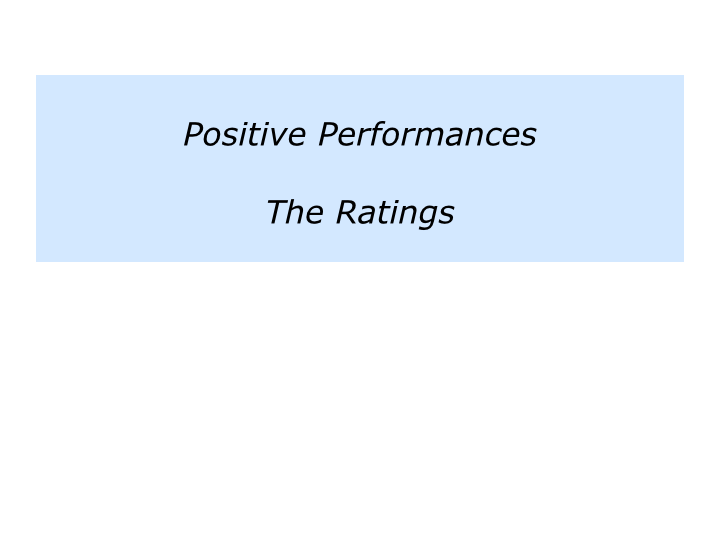 That might sound laudable, but their customers could not care who is Number 1. They simply want to be helped to succeed. 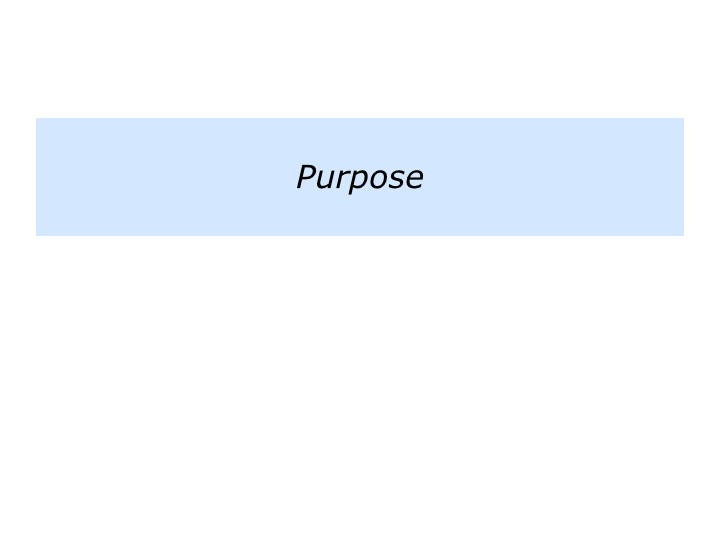 “But how is it possible to come up with a unique purpose?” somebody may ask. Sometimes this is hard, but it also highlights the true meaning of uniqueness. David Maister, author of The Trusted Advisor, said something along the following lines. “I believe every company in the world has roughly the same mission. “They all say they want to improve their profits, provide great products and be great places to work for their people. Let’s return to your team. Imagine that you have reached general agreement on the team’s purpose. It is time to take the next step. achieve by a specific date. This can be become the Picture of Success. The team’s purpose may remain constant. At the same time, however, this will be expressed in various ways in the future. You can translate this into specific goals you want to achieve by a certain date. This is a photograph of how your purpose will be expressed at that particular time. People can focus on achieving this picture of success. Imagine that you have done these exercises. The next step is to focus on the key principles the team – and the individuals – can follow to achieve the goals. Different teams may use different terms for how they aim to do the daily work. They may talk about following their principles, credo or strategies. Some talk about following their team’s ‘way’. Good teams often build a positive culture. Marvin Bower described culture as: ‘The way we do things around here.’ So it is important to explain the principles that people are expected to follow to reach the goals. During the early days of IBM, for example, people were encouraged to follow the company’s Basic Beliefs. The wording of these evolved over time, but they focused on the following themes. Respect for the individual. Service to the customer. Excellence in everything we do. IBM was successful for many years, particularly when translating these beliefs into action. It hit trouble, however, when failing to follow these beliefs. The company began to recover when focusing on an evolved set of beliefs. 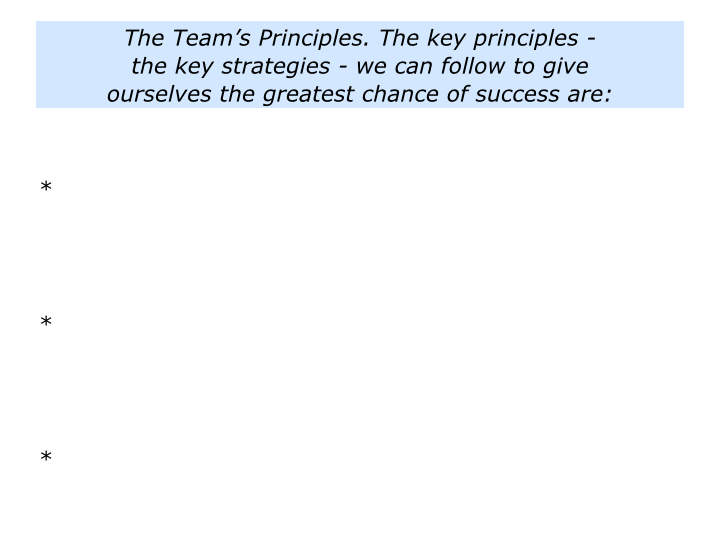 Imagine that you want to clarify the key principles the team to follow to achieve its picture of success. How to make this happen? One approach is to follow a similar format to that used for creating the team’s purpose. Gathering people together, you can invite each person to make three Post-it Notes. They are to complete the following statement. To go up in turn to stick their Post-it Notes on a flip chart and describe what they have written. To clarify the common themes that emerge. 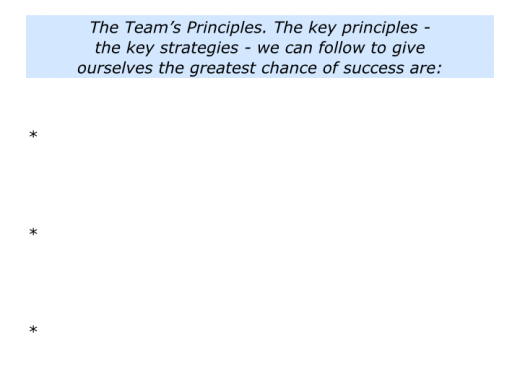 To agree on the key principles the team can follow to reach its goals. “That sounds sensible from a team point of view, but what about people’s individual behaviour,” somebody may say. Good teams often take this step. If you are recruiting a team for an Antarctic Expedition, for example, you may say something along the following lines to applicants. Let us know if you would like to apply to join the expedition and pursue these principles on the way towards achieving the purpose. Good leaders explain the reasons why it is important for people to behave in certain ways to build a positive culture. The professional standards are based on what is required to deliver the mission. They are not there to simply satisfy the leader’s whim. John Wooden, the legendary basketball coach, encouraged athletes to fulfil their potential as people and players. He never mentioned winning, but his teams won more titles than any other in College basketball history. During his early career John began developing the Pyramid of Success. This consisted of guiding principles that athletes could follow both on and off the court. You can learn more about his approach on the Coach Wooden website. Here is the link. Different teams use different ways to communicate the principles that individuals are expected to follow in their daily work. 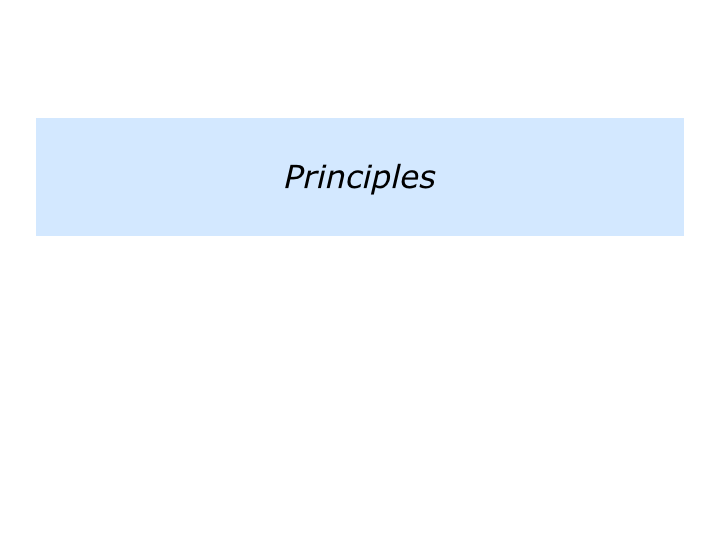 Some translate the principles into professional standards. They then explain these in the following terms. You will choose your own way to communicate the individual principles that you want each team member to follow. 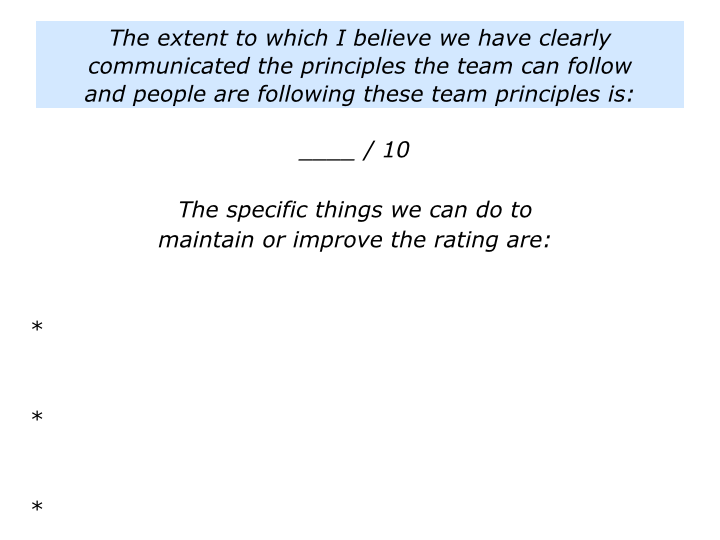 If appropriate, however, you can follow a similar format to that which produced the team principles. To go up to turn to stick their Post-it Notes on a flip chart and describe what they have written. 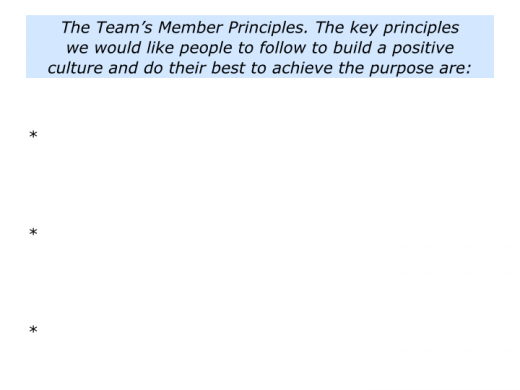 To agree on the key principles the individual team members can follow to build a positive culture and do their best to achieve the team’s purpose. Imagine that you have done all these exercises. 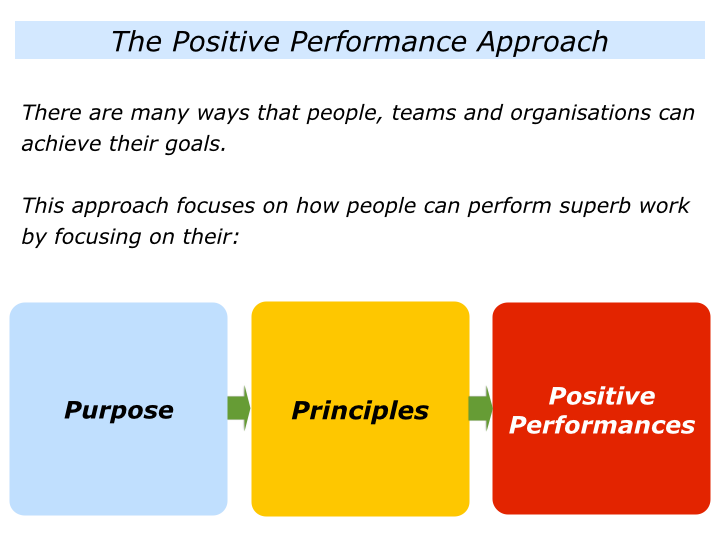 It is then time for people to put the principles into action and deliver positive performances. Good teams manage by outcomes, rather than by tasks. They explain the team’s purpose, principles and, when appropriate, the required professional standards. They then explain the desired outcomes. 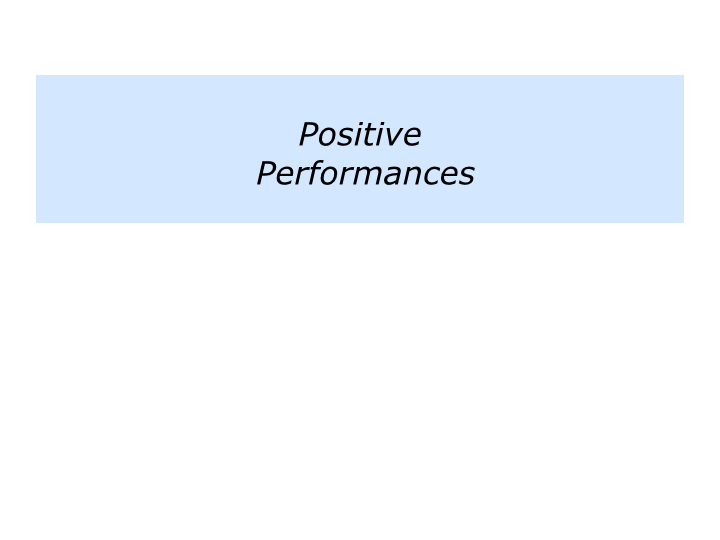 Different teams have different ways of describing these outcomes – the desired positive performances. Some just focus on how they can do everything possible to achieve the picture of success. Another approach is often used in, for example, service companies. They start from the destination and work backwards regarding what they want to hear people saying about their service. 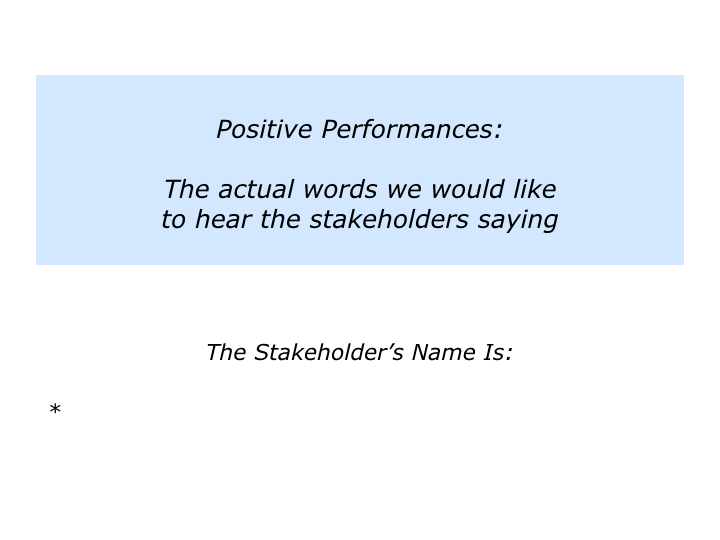 People make flip charts with the name of each stakeholder at the top of each chart. These can be external or internal stakeholders. 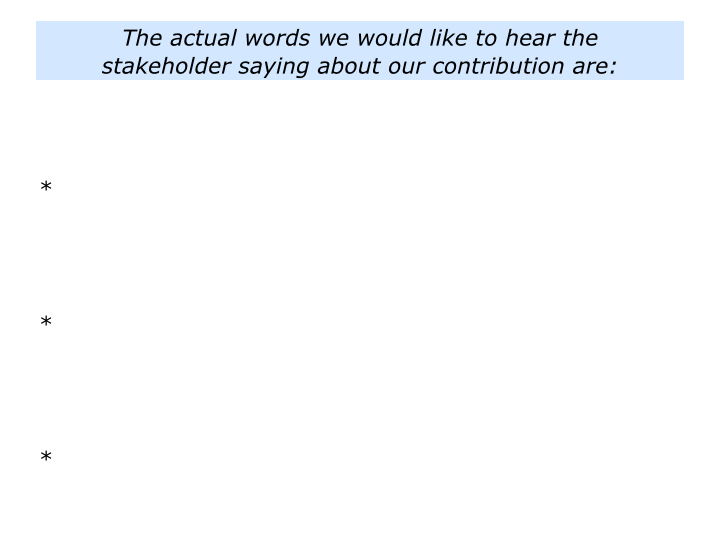 People write the actual words they would like to hear each of the respective stakeholders saying about their work. 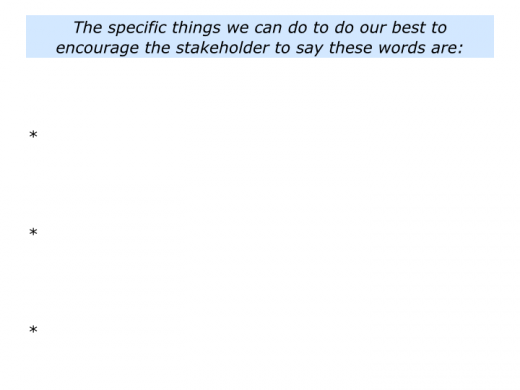 They then describe how they can do their best to get this response from the stakeholders. People who compete in sports use a similar approach. 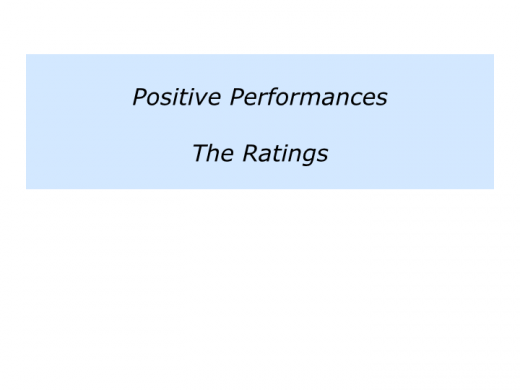 Starting from their end goal – such as a particular event – they clarify what they want to be saying about the own performance on that day. Preparing for a Championship Final, for example, they focus on what they can control. They can control their attitude, their chosen strategy and the effort they put into implementing it successfully. They can’t control the result. People aim to do everything possible, however, to do their best. So they may say something along the following lines. Final, we want to be able to say the following things. We kept giving everything on the day and performed at our best. We kept doing the basics and then added the brilliance. 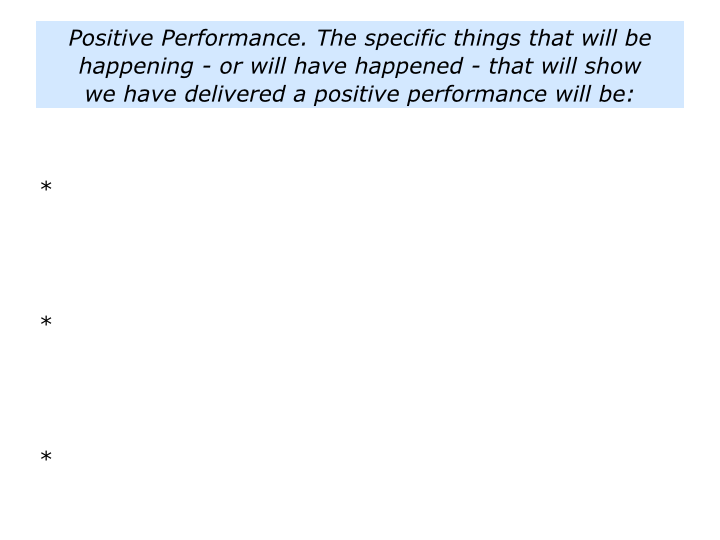 We kept being positive, professional and delivered a peak performance. Imagine you lead a team. You will have your own approach to measuring its performance. If you wish, however, you can invite the team to complete the following exercise on this theme. Describe the specific things that will be happening – or that will have happened by a certain date – that will show the team has delivered such a positive performance. 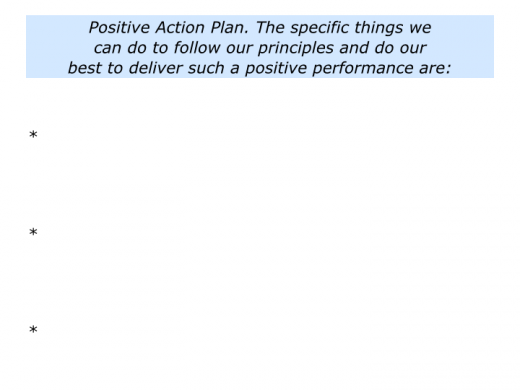 Describe the positive action plan – the specific things the team can do to follow its principles and do its best to deliver such a positive performance. 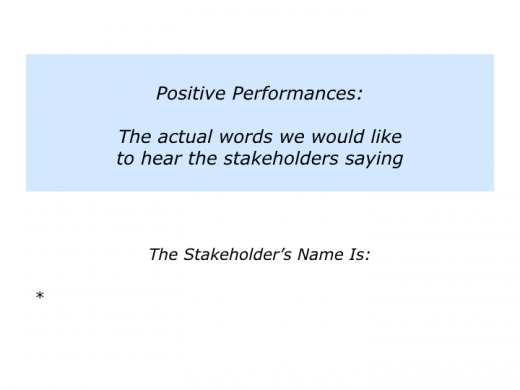 Describe the positive benefits for all stakeholders – such as the team members, team, customers, organisation and investors – of the team delivering such a positive performance. “This approach sounds fine, but how do you maintain the momentum?” somebody may say. Good teams are committed to constant improvement. One approach they use is to invite the people in the team – or in a large organisation – to keep doing reality checks. If you wish, you can ask people to keep focusing on the purpose, principles and positive performance. Looking at each of these areas, they can rate the extent to which the ideas are being translated into action. They can do this on a scale 0 – 10. Invite people to go beyond simply putting a score. Ask them to suggest the practical things that people can do to maintain or improve the ratings. You can then, if appropriate, apply the specific ideas and build the desired culture in the team. There are many models for building superb teams. One approach is to encourage people to focus on the purpose, principles and positive performances. Here are the final exercises that you may want to use to ensure people keep developing as a team.